Dieter used gobase's replay feature and its success indicator (SI) while discussing this game. : opening at komoku is the fashion.The rest of the opening moves were all second choice to me. : 13 games in gobase's database. I didn't expect the avalanche, but a or b instead. being on this side's 4th line, I expected at b.
John F. What you haven't said, Dieter, is that (using GoGoD data where we have 12 matches) is that a occurs once and b occurs once, so the professional common-sense seems to be to play the avalanche. But, even if for slightly different reasons, I must say I share your surprise that such ordinary looking moves and an ordinary looking fuseki seem so rare, A case for Charles Matthews, I'd say. Bill: As for the hane at a, that joseki was already being questioned in print when I was learning go. was considered efficient. (It does improve on Ba, and serves as an extension for both Black walls.) 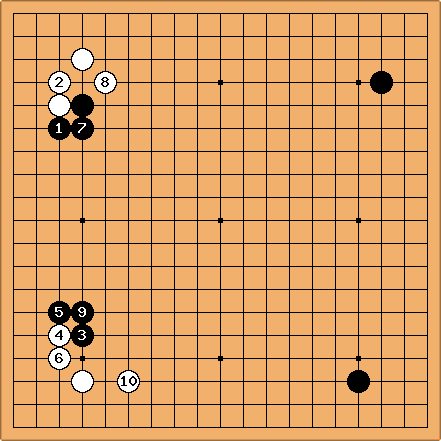 However, Go Seigen has criticized Black's plan in 21st Century Go, showing how Black falls behind. Perhaps other pros have been critical as well. 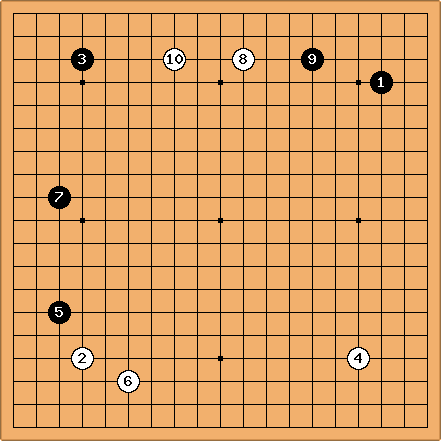 - are forced moves, completing the joseki. Both White's hane at or Black's magari at a would be unbearable. I got the direction correct, but missed the spot it by one space. 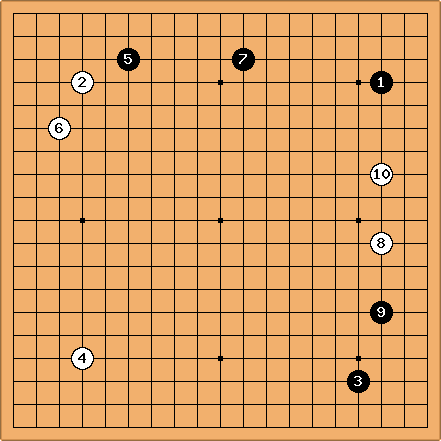 HelcioAlexandre: at b would allow a great cap at c.
phenomene: The position on the upper side was played in the Fan Hui 2p-Asai Hideki 6d (aka intetsu 9d on KGS) game in 2003 Paris tournament with at b. Comment from the players after the game: "b is too low, it should be at ." spot on ! White doesn't want to be pincered. When pincers anyway, there is more room to settle in the corner. to are joseki. 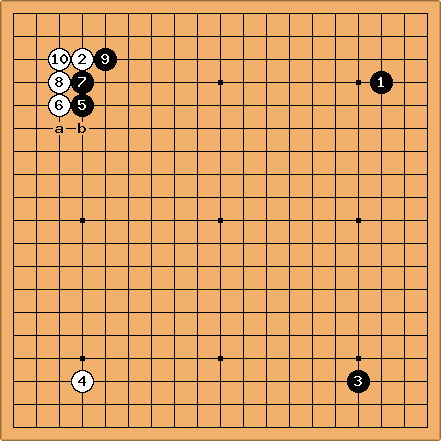 Note by Jan van Rongen: The position before occurred already in the second game of Pak Yeong-hun in the semi-final of this Samsung Cup. 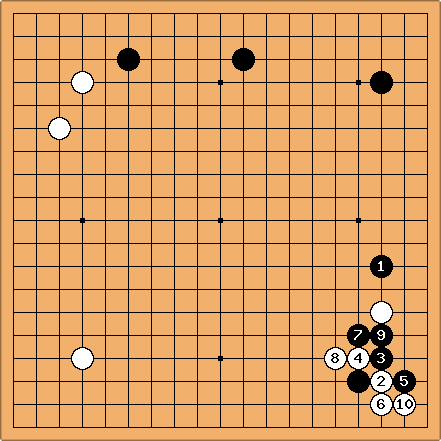 There his opponent (Xie) played d . Cho also played against a similar fuseki in the first game of the semi-final against Hu, who had played in the first diagram on hoshi. 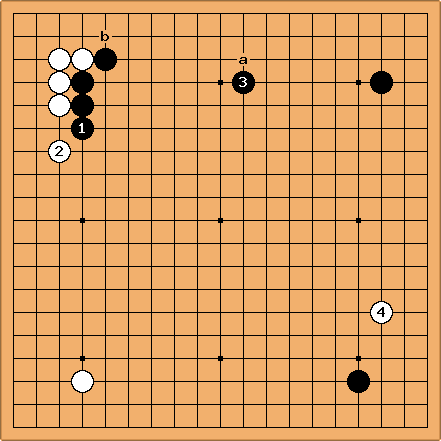 completes the joseki but Black continues up till . At I expected White to cut at a. Second idea b and only third , with a little help from the SI. HelcioAlexandre: is an example of an invasion on the widest space. Dave This game can be perhaps be better understood with a little context added. It looks like Pak switched to , pretty much exclusively earlier in 2003. Prior to that he usually opened with at 4-4. His intent seems to be to play a mini-chinese. 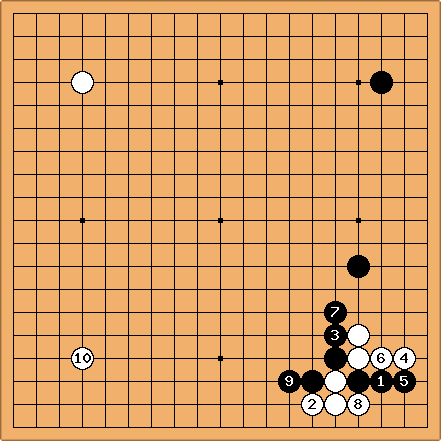 This is the way Pak's game against An Cho-yeong in the BC Card Cup began two weeks before the Samsung match. In the first game of the Samsung match, Cho played Pak's favorite opening against him. In both the second and third games Cho held White. He chose two different methods of avoiding the mini-chinese. In any case, White played the approach at instead of answering Black's move in the upper left. White played lightly in the upper right and took sente to pincer . 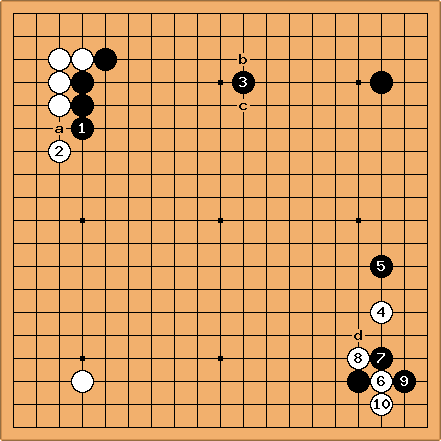 Remember that Black frequently gets to play double kakari as compensation against anti mini-chinese strategies (see BQM 31 / Modern Double Kakari). 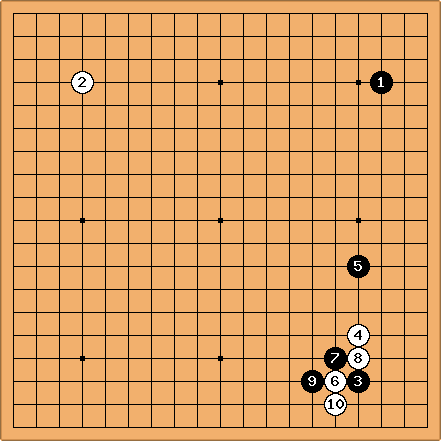 This is a game from the 21st Meijin League (1996) where Cho previewed the variation along the right side 7 years before the Samsung match. For what it is worth, Pak played the same kosumi in the Samsung game as here. However, Cho played a 2-space extention down the side at a instead of pushing at as he did here.